I am sitting here on this balmy Easter Sunday with an extremely full stomach after a big day of indulgence. My day began with an early coffee and some leftover dolcini (Italian sweets) from our family get together last night. After early Mass a Baileys was in order along with plenty of helpings from the chocolate basket on the coffee table (that was my breakfast, in case you were wondering!). On the menu for lunch it was pasta bake (like lasagne but with pasta), which has become somewhat of a festive tradition in our house, accompanied by mini pizzas and red wine. After a brief rest in front of the telly an array of deserts including Rocky Road, Red Velvet Cupcakes, Cannoli and more Easter eggs awaited us. 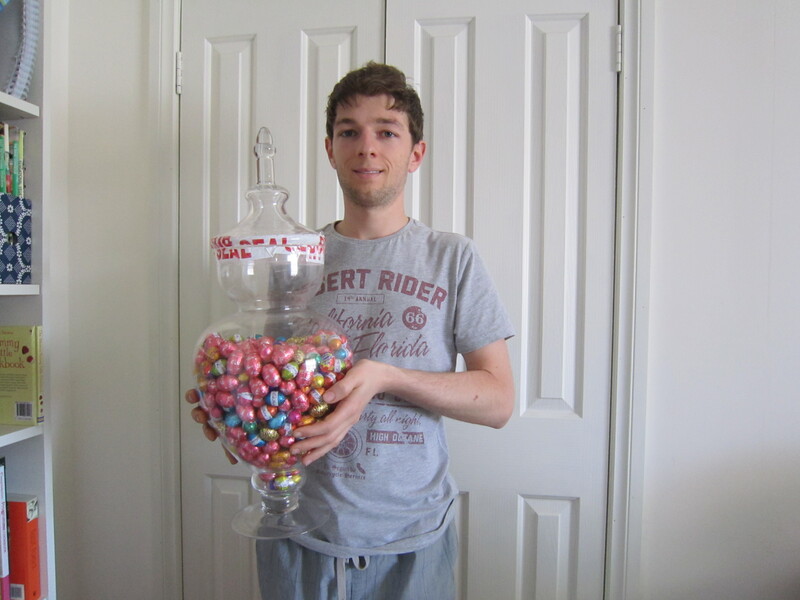 Its the prize I won at work last year for correctly guessing the 510 easter eggs sitting in that jar! 510! It ended up sitting on our coffee table until about July, tempting the whole family to grab one every time we walked past. All I really wanted to say today is that even though this behaviour would likely give my doctor a heart attack, diabetes is a 24/7 job, 365 days of the year. Its not something that I can leave at my office desk at 5pm on Friday and return to at 9am on Monday. And frankly, I’m sick of people telling me “oh, you shouldn’t be eating this, should you?” without fully understanding diabetes. So long as I am aware of what I am consuming and how I have to respond, I think I’ve earned a day (or two!) of indulgence. Cheers for all the fantastic support so far, and wherever you are in the world, HAPPY EASTER! Unless I’m hypo, biscuits are generally a no-no for me. But lets face it, a cuppa is pretty boring without something sweet to go with it. 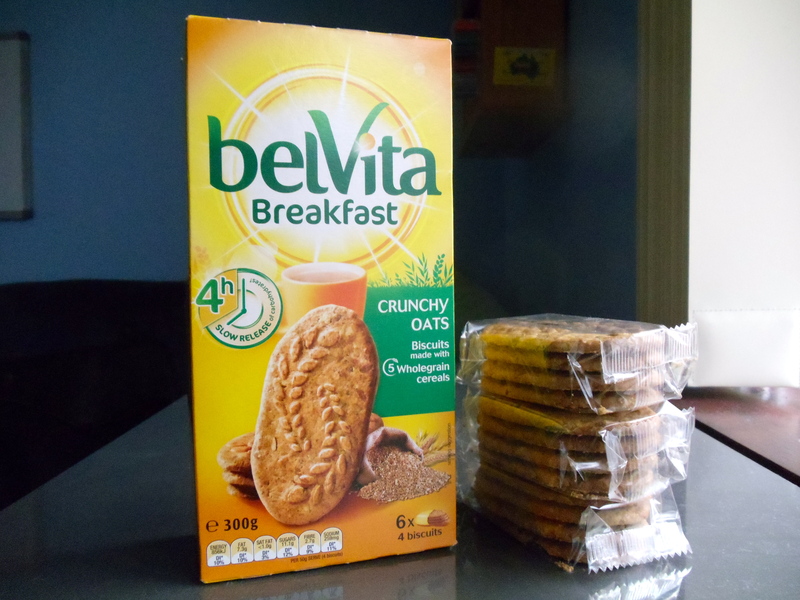 Earlier this year I stumbled upon Belvita Breakfast Biscuits in the supermarket, and seeing Low GI on the box pretty much sold it for me. There are six different varieties including Chocolate, Cranberry, Fruit and Fibre, Milk and Cereals, Crunchy Oats and Honey and Nut that boast five wholegrain cereals and a slow release of carbohydrates. Each box contains 6 individually wrapped packets of four biscuits, which makes it a great long lasting staple for my desk drawer at morning tea time. The ingredient list doesn’t look too shabby either, with some healthy-sounding ingredients comprising the 63% cereals and oats that Belvita is made of. I’m also impressed by the “4 hour slow release of carbohydrates,” meaning that my blood sugar levels aren’t likely to skyrocket from a little indulgence. Other health related research on the box, conducted by Belvita, gives me confidence in putting the product in my shopping trolley. On the downside, I’m not convinced that these biscuits should be consumed as a substitute for your breakfast carbohydrate source as the box suggest (they are biscuits, after all!). 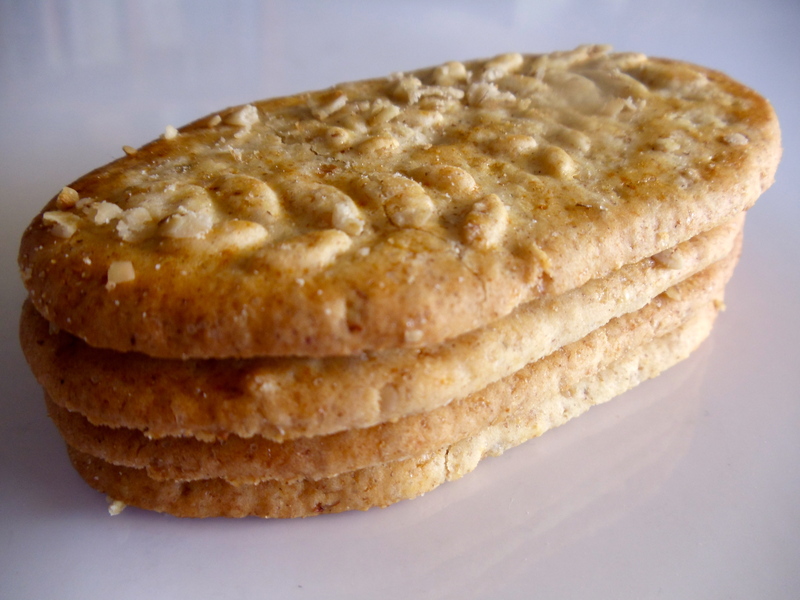 I normally opt for a smaller serving of 2 biscuits as a snack, rather than 4. I would also be wary of the percentages of fat and sugar in the product per 100g (ideally 10 per cent or less). With the fat per 100g ranging from 14 to 17 per cent and sugar ranging from 20 to 28 per cent, I would recommend choosing one of the varieties at the lower end of the scale such as Milk and Cereals or Cranberry. Belvita’s tastes have been a hit and miss for me. While the Honey and Nut variety was absolutely delicious, the Milk and Cereals was off the mark. Somehow I just don’t think the flavour of milk and cereal goes down well in a biscuit, but perhaps you’ll disagree. With that being said, I would still recommend the brand as a diabetes friendly snack (in moderation, of course!). I only purchase Belvita occasionally, mainly due to the fact that a box will last me several weeks and I like my variety! 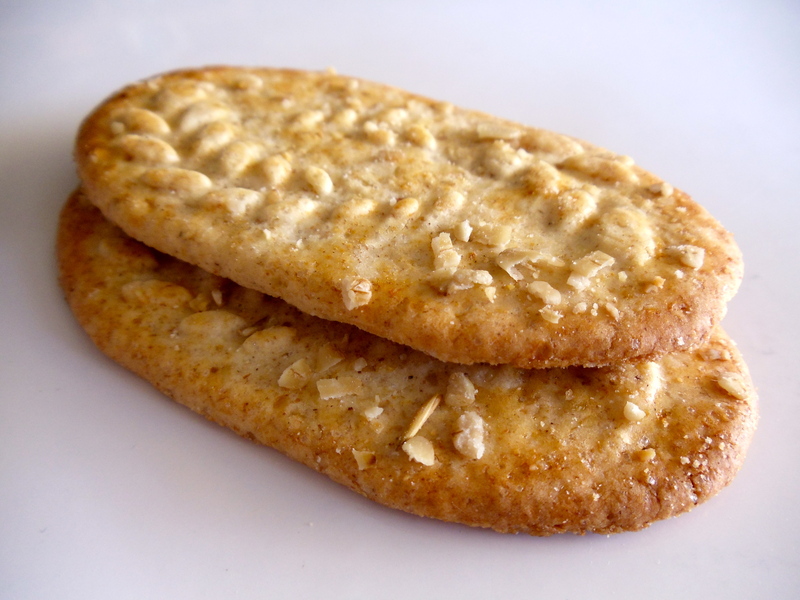 Belvita can be found in Woolworths, Coles and IGA supermarkets in Australia. At around $4 to $5 per box, Belvita is double the price of a packet of comparable Arnott’s biscuits. However, I don’t mind paying more for something that is better for me, and they are often on sale at up to half price. There aren’t a lot of products in the biscuit aisle that can proudly identify as diabetes friendly, so well done to the guys at Belvita for coming up with something original. NB: This information is an average across all six varieties, precise information can be found on Belvita’s website. GI rating of between 45 and 54 (low). NB: Not certified by the Glycaemic Index Foundation, information is backed by Belvita’s scientific studies involving the breakfast biscuits. Coles, Woolworths, IGA and other major supermarkets. I’ve had my coffee and tea with two sugars for as long as I can remember. It probably stems from a young age. It was an acquired taste when I was first introduced to it as a teenager, and sugar was a natural response to make it more bearable. 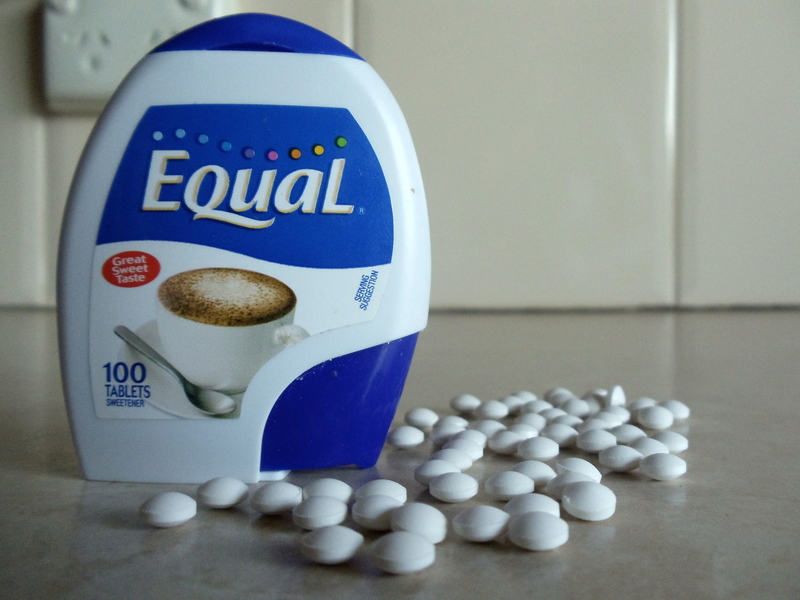 When I was diagnosed with diabetes, I switched to Equal sweetener tablets. As the name suggests, it boasts equal sweetness to one teaspoon of sugar with significantly lower kilojoules, calories and carbohydrates. For me, it was great because I would still be able to enjoy my tea and coffee with sweetness and not have to worry about having my blood sugar levels skyrocketing. I wouldn’t even have to consider that dreaded task of cutting out sugar. Hell, I even thought I was being healthy. But, of course everything has a downside. 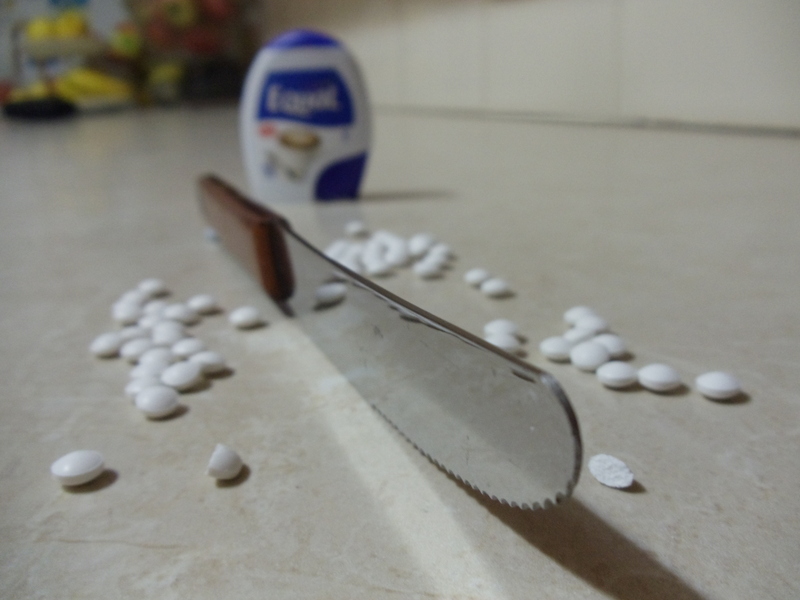 Sweeteners are, after all, an artificial product. Just have a look at the back of the box if you don’t believe me – I don’t even know what any of those ingredients are! Harvard Health suggests that artificial sweeteners play tricks on your brain. You’ll use the carbs/calories/kilojoules (or whatever you call them) you’ve saved as an excuse to indulge in sweet stuff. And Daily Mail reports that the chemicals in artificial sweeteners fail to trigger the ‘full’ feeling in our brain, leaving us less satisfied and craving more. The end result: weight gain and obesity. So, now that I’m a few years older (and perhaps a little wiser! ), I’m not comfortable about being so reliant on sweeteners in my hot drinks. I’ll have anywhere between 2 and 4 cups of tea or coffee on an average day. Given that I add two Equal tablets to each cup, that’s 8 tablets a day of an artificial product going into my body. After deliberating on these thoughts for a long time, in December I finally decided to do something about it. 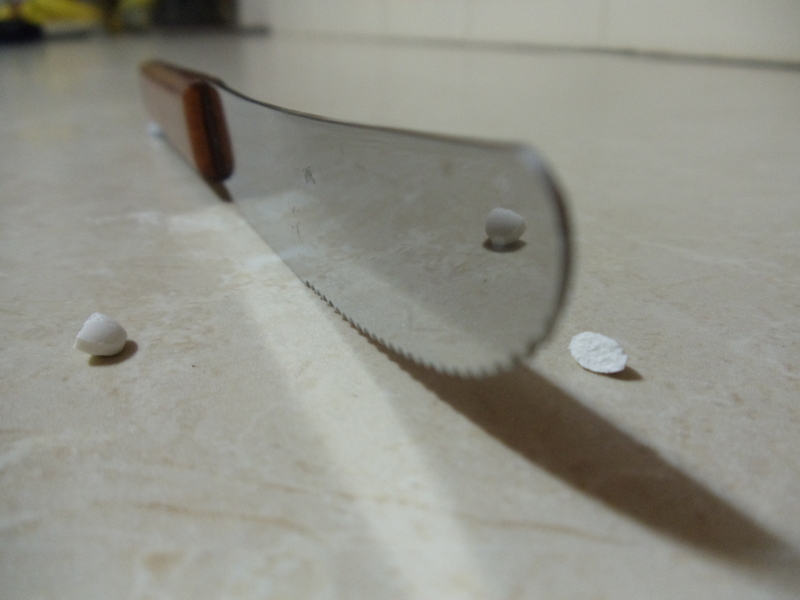 I bravely began chopping my Equal tablets into halves and reducing my sweetener consumption from 2 to 1 ½ tablets per beverage. Coffee is quite difficult, particularly if you’re an espresso drinker like me. It’s very strong and even bitter at times, making it difficult to forego sugar. However, if you love your lattes, capps and flat whites, generously adding milk to your coffees will make your mission much easier. Tea is a little easier as its not as intense and there’s much more choice. My tip would be to leave a little room in your cup for some extra milk to help compensate for the sweetness you are losing. I also found it was much easier to forego sugar in lighter blends such as green, chamomile and herbal teas, as well as flavoured blends. I’ve been down to one tablet per cuppa for the past couple of weeks. At the moment I’m not sure whether I will cut back further, but I’ll probably wait a while longer before making that decision. If this is where it ends, I’m proud of what I’ve achieved. I’ve reduced my reliance on sugar and artificial sweeteners by 50%. That’s 4 Equal tablets or 4 teaspoons of sugar that I no longer need to add to my coffee each day. And the icing on top of all of this – I now have a stronger sensitivity to sweetness! Last week I was served a coffee with 2 sugars, and it actually tasted too sweet for my liking! So, thanks to this experience, I will be more conscious when I am consuming sweet food and drinks in future. 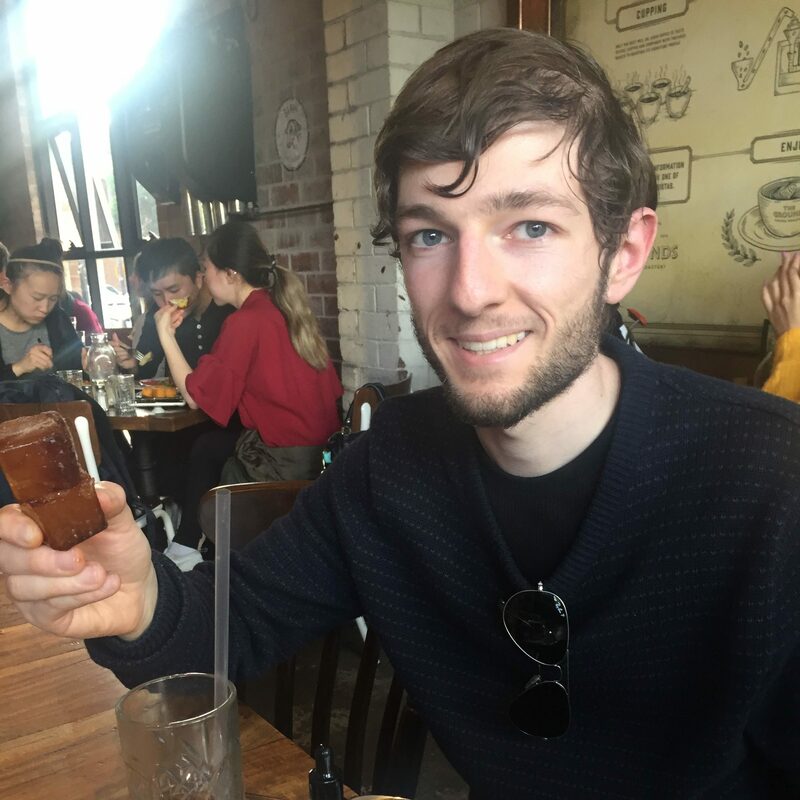 Each cutback was very significant for me, and it took me a few weeks (depending on how often you have coffee and tea) to get used to the new taste before I was ready to cut back again. But, that being said, I can’t recommend this enough. When I was diagnosed with diabetes, I was given the spiel about wearing enclosed shoes and socks on my feet. And to be fair, foot care is a very serious thing when you have diabetes. Basically, its important to protect the feet from cuts, scrapes and other injuries. Because poor diabetes care can damage the nerves and blood supply to your feet, any injuries or resulting infections could potentially be threatening to the limb. That last bit freaks me out every time, so enough serious talk for now. But there’s a nice, simple summary on Diabetes Australia’s website if you want to read more about footcare. So, being the stubborn person that I was, I dismissed this idea instantly. I hated the idea of “enclosed footwear.” Besides, I was young. Reasonably healthy. The chance of something happening was extremely unlikely. My mind was made up, and I decided that my thongs would accompany me as I entered my first year of uni. And what a mistake that was. Walking around a big campus was hard work. It was hot, my feet were sore and by the end of the day I was dying to make it back to the car. I had nasty red marks on my feet, stinging blisters inbetween my toes and uncomfortable friction on my skin just from walking around. But despite how much discomfort I was in, it took me ages before I woke up to my senses and attributed the problem to my thongs. After looking around, I ended up finding these. The main difference is a synthetic material strap, as opposed to rubber. This meant less friction against my skin and more comfort when walking around for longer periods. 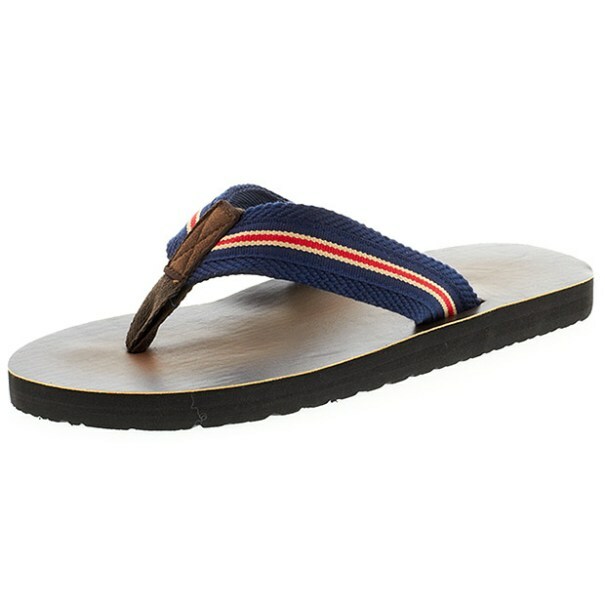 These also have more of a smarter look than rubber thongs (especially those bright, cheap ones! ), making them more suitable for smart casual wear. Win win! So, the morals of my story? #1: Rubber thongs are rubbish. Throw them out. Hell, people without diabetes shouldn’t even be wearing them. #2: Don’t give up casual shoes just because you have diabetes. But do make sure they are comfortable and suitable for the activity you plan on doing. There are plenty of more comfortable alternatives available such as my canvas thongs, sandals or slip ons. Its worth looking around. But if you are doing a lot of walking around, shoes may be a better idea. What’s your favourite choice of footwear that works with your diabetes? Have you had any memorable experiences that you’ve learned from? I start work very early in the morning, and my job requires me to be on my feet all the time. So by 10am when I am in desperate need of a mid morning pick me up, a Muesli bar is usually my snack of choice. 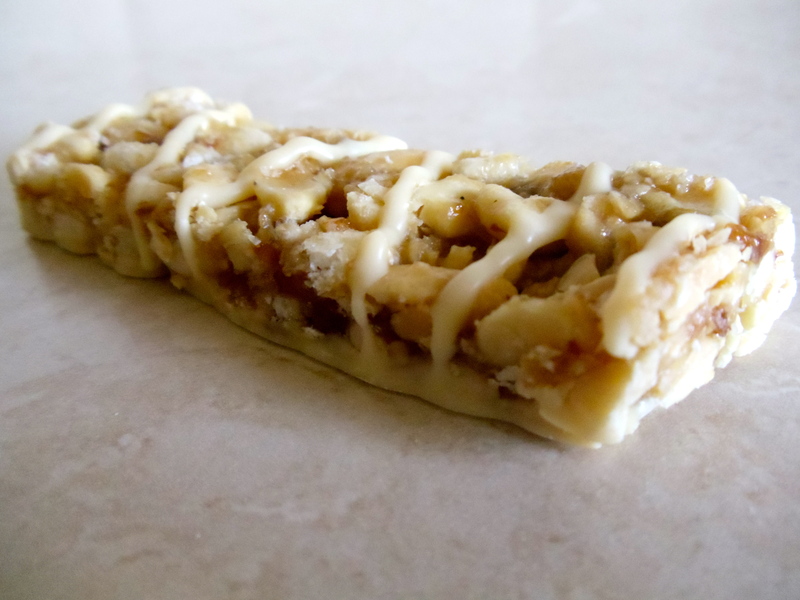 I like the idea of Nice and Natural nut bars as they are something different to the usually chewy, oaty muesli bars that I’m used to. 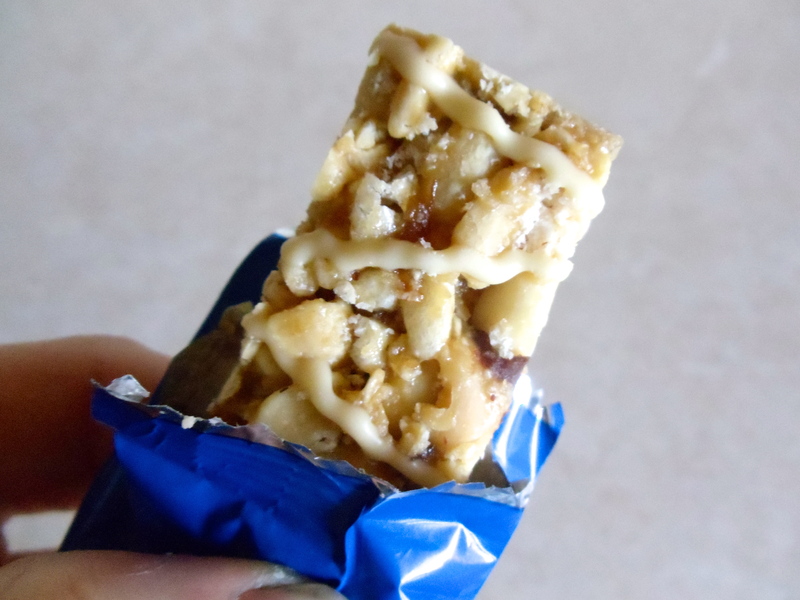 There are also many advantages to nuts being the main ingredient in these bars. They are a good source of protein, which is important for maintaining energy levels, muscle mass and body cells such as blood, skin, nails and hair. Nuts also provide a sustained energy release, meaning you’ll feel fuller for longer, and have a lower carbohydrate count compared to muesli or oat based bars. The downside is that the fat content is higher than I would like. I like to choose items with less than 10% fat content (i.e. 10g of fat per 100g), but then again you usually only eat these in small serving sizes anyway. The bulk of the fats are healthy fats from your nuts, and I would usually burn it all off throughout my working day. 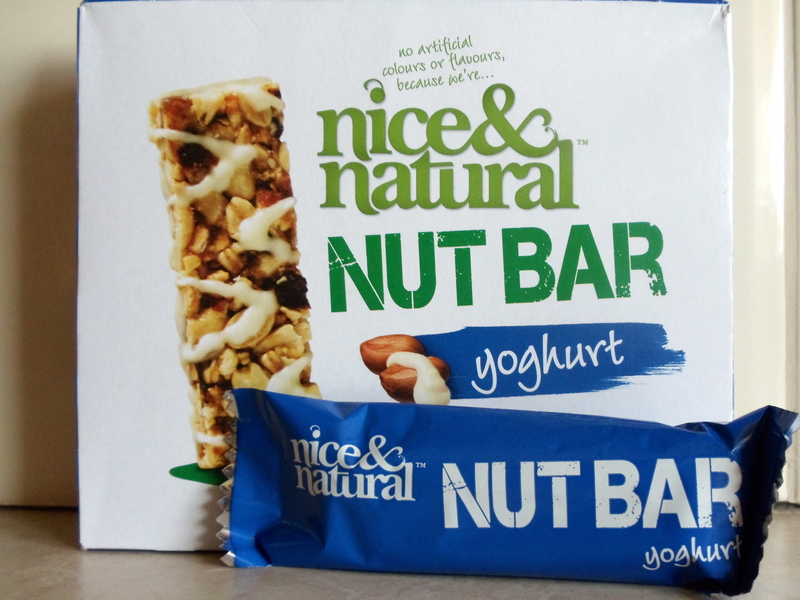 With five different varieties including choc top and yoghurt top, I am yet to get sick of Nice and Natural Nut bars. Not too sickly and not too sweet, the taste is just perfect for me. They are in my shopping trolley every week. NB: Nutrition information is an average across all varieties and is per individual bar. The core ingredients including nuts, oils, dried fruit and oats are Low GI. The bars also contain some higher GI syrups, flavourings and sugars. However I don’t think these would raise the GI of the product significantly, as the bars don’t appear or taste overly sweet.